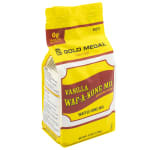 With Gold Medal 8212 Waf-A-Kone mix, you can create delicious waffle cones that your customers will love. Each case contains six 5-pound bags and should yield approximately 450 cones. Only 1 to 1.5 ounces of mix is needed to produce a full waffle cone. With the delicious flavor of vanilla, you are sure to keep your customers happy as they enjoy their favorite ice creams on a homemade vanilla waffle cone made with Gold Medal 8212 Waf-A-Kone mix.